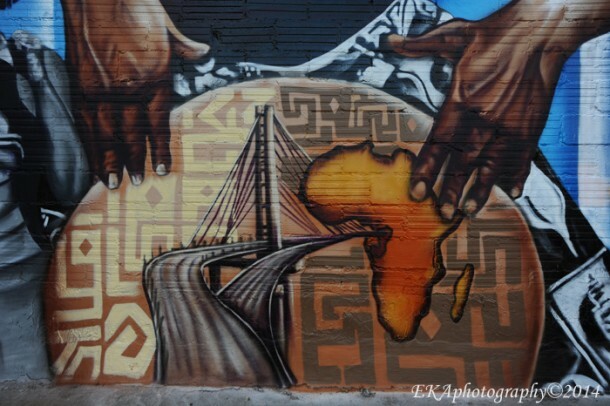 Street Art in Oakland is on the rise. Many streets in West and East Oakland have been turned into virtual galleries with vibrant murals of urban expression, and Uptown/downtown isn’t far behind. 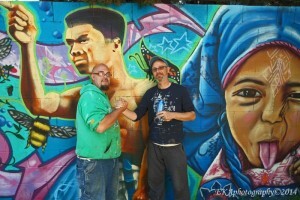 Not surprisingly, these efforts – which include the approximately 100 Oakland murals painted by the Community Rejuvenation Project over the last three years – have come to the attention of gallery owners, who are beginning to embrace the street aesthetic as a unique facet of Oakland’s urban art scene. On Thursday, Sept. 18, Slate Art , a brick-and-mortar gallery curated by former Art Murmur ED Danielle Fox and Shelley Barry, hosts “Oakland Here and Now,” a live painting event held outside the Uptown gallery, featuring local painters who will create complete works on aluminum panels while an audience watches the entire process, from start to finish. 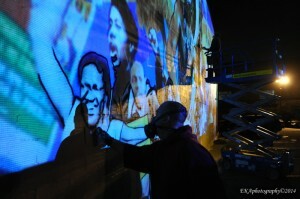 Following the live painting, the audience will have opportunities to engage with the artists. Among the four finalists are two CRP artists: founder/ED Desi Mundo and Senior Painter Peskador, who recently completed Phase I of the Alice Street Mural Project, an ambitious and visionary undertaking which consists of three large walls at 14th and Alice Sts., painted with historical and community-affirming imagery connecting the Chinese American and Afro-Diasporic communities centered around the Malonga Casquelord center and Hotel Oakland. 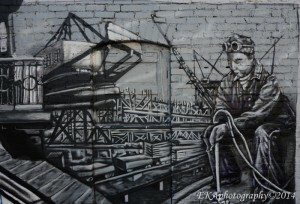 The connection between Oakland artists and the street scene influences their gallery work, Fox added. The other two featured artists also bring much street art experience to the table: Nite Owl, an Oakland-based graffiti artist originally from NYC, is known for his colorful images incorporating owl characters, reportedly influenced by Dr. Seuss. Meanwhile, Cameron Thompson is a California native and mixed-media artist whose aesthetic is equally informed by his aerosol muralist background as a member of the AS, YMI, and FOES crews, and his appreciation for nature-based imagery and characters. “Oakland Here and Now” takes place between 6-8pm, Thursday, Sept. 18, at Slate gallery, 474 25th St., in Oakland.